Nature’s Bakery, a family owned business committed to producing healthier snacks, burst onto the natural snacks scene in 2010, and earned the Nevada Safety and Health Achievement Recognition Program award in 2017. Quality Assurance Supervisor Ryan Evanson was dealing with one major food safety issue when he first met with the Eagle Protect team - consumer complaints due to glove fragments in the finished product. In 2017 alone they received 19 complaints, and had 9 complaints as of June 2018, when they decided to change glove suppliers to Eagle. The “blue plastic or rubber” objects in the product were easily identified as fragments from failures of the previous blue nitrile gloves being used in production. Quality Variation: The glove quality varied drastically from order to order and were prone to ripping. This can be due to cheap and inconsistent glove ingredients and process during manufacturing. Inventory Shortages: When a particular size wasn’t fulfilled it forced the employee to use larger sized gloves. This effected glove fit, with the extra material prone to catch on equipment causing potential glove fragments. Nature’s Bakery received 28 consumer complaints in the last 18 months concerning blue plastic or rubber pieces in the product, ranging from small pieces to entire glove fingers while using these 5 mil nitrile gloves. Employees were also unhappy with the current glove’s quality as they would easily rip and tear, which required them to change their gloves more frequently. 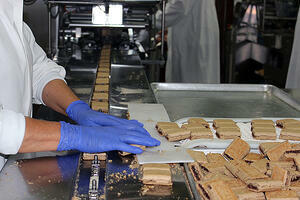 Nature’s Bakery worked with their previous supplier to change gloves in order to prevent glove fragments. The supplier’s solution was a thicker glove. "...Eagle was more attentive to our problems, and offered a better quality and cheaper product." The bakery’s previous supplier suggested a 7 mil nitrile glove to alleviate ripping issues. The new glove did address the gloves failures, but there was still a lack in consistent glove quality per order and it created new complications. As is common with an unnecessarily thick glove, the employees found them uncomfortable and complained of increased hand fatigue. Working together with Eagle Protect we found a better solution. Directly resulting from higher quality ingredients and manufacturing processes the thinner, yet stronger Eagle Sensitive nitrile (3.5 mil) glove was just what Nature’s Bakery needed. “We haven’t received a single consumer complaint for rubber pieces in our product since making the change and I would directly attribute that to Eagle Protect and their product quality,” said Evanson. This logo means Eagle uses business as a force for good. We are the world’s only B Corp certified supplier of disposable gloves and clothing. Does this case study resonate with your business? Contact an Eagle Protect food safety disposable glove expert today! Cheap gloves are made with low-quality ingredients which cause an increase in failure rates. 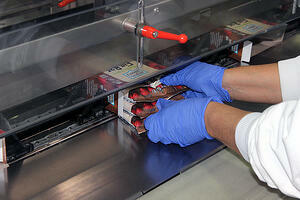 Glove fragments in products can be eliminated with well fitting, high-quality food safe gloves. “We know the glove isn’t going to rip and we get the same box, same product, every order." “Eagle looked at the problems we were experiencing and what changes would improve our processes. They wanted to help us, not sell us."